Scanpan CTX Dutch Oven is equally efficient as a sauce pot and a baker. Perfect for simmering stews and soups, baking casseroles and roasting vegetables or chicken. Multi-layer fused construction results in rapid and even heat distribution throughout the body of the cookware. Recycled aluminum core with Ceramic Titanium PFOA-Free Non-stick interior surface and 18/10 Stainless Steel exterior. Pan is oven and broiler safe so going from the stove top to the oven has never been easier. Stainless Lid features glass window to view cooking progress. Pan is easy to care for, require 5-second cleaning by hand or just throw it in the dishwasher - this pan will last a lifetime. Scanpan introduces the world's first induction-safe, certified PFOA-free "green" nonstick cookware of heavy-gauge 5-ply construction for professional and home kitchens. Ultra-smooth ceramic-titanium nonstick interior is superior in the quick-release of foods, and so extremely durable, metal utensils will not damage the surface. 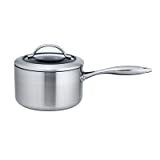 Versatile Scanpan CTX saucepan creates flawless sauces and gravies, allowing quick evaporation and reduction of liquids. Patented titanium nonstick surface developed by Scanpan not only offers foolproof release, the silky-smooth interior prevents scorching. Made with 5-layer pressure-cast aluminum and stainless-steel for excellent heat distribution, this cookware provides outstanding heat retention without hot spots. The integration of tempered glass with a wider stainless-steel rim on the lid lets you monitor the cooking process while providing greater retention of heat for precise cooking. Side vents conveniently release steam. Inner rubberized seal adds to the durability of this contemporary Danish-made design. Smooth curvature-design handles stay cool to the touch and are a greater height from the glass for ease and additional safety in handling, and riveted underneath the lid, adding to the sleek appearance of the Scanpan CTX cookware. Brushed stainless-steel finish. Dishwasher-safe. Scanpan CTX Wok with Rack can be used for a variety of cooking methods: stir-frying, sautéing, deep-frying or poaching. Whether you're cooking up Pork Fried Rice or creating a healthy version of a Chinese Classic, this pan will not go out of style. Multi-layer fused construction results in rapid and even heat distribution throughout the body of the cookware. Recycled aluminum core with Ceramic Titanium PFOA-Free Non-stick interior surface and 18/10 Stainless Steel exterior. Pan is oven and broiler safe so going from the stove top to the oven has never been easier. Pan is easy to care for, require 5-second cleaning by hand or just throw it in the dishwasher - this pan will last a lifetime. 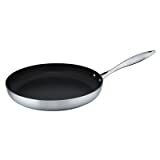 CTX Frying Pan Size: 12.75"
65003200 Size: 12.75" Features: -CTX collection. Dimensions: Size 8" - Overall Product Weight: -2.71 lbs. Size 9.5" - Overall Product Weight: -3.62 lbs. Size 10.25" - Overall Product Weight: -4.28 lbs. Size 12.75" - Overall Product Weight: -6.39 lbs.